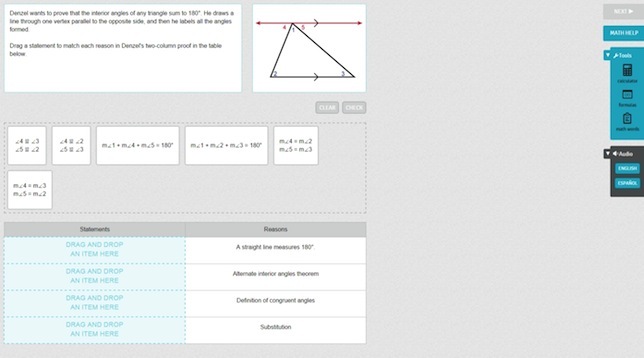 Education technology company Think Through Learning has added geometry to its high school line of Think Through Math software. Math help is available for grades three and higher. The program, which aligns to state learning standards, both Common Core and otherwise, combines live tutoring, adaptive instruction and a motivation system. Tutors, all certified math teachers, work with students through an online two-way interactive whiteboard. A typical encounter is about four to five minutes, according to the company. To motivate students, the company uses gamification. For example, as students enter the program, they pick avatars to customize. As they work through the content, they can acquire points that enable them to "buy" features to customize the avatars. Students can earn badges as they complete math challenges or multiple lessons in a row. They can also apply points to specific charities, such as Wounded Warrior or Boys and Girls Clubs. Students stay on top of their status through a personalized dashboard that includes a leaderboard and a list of the badges they've earned. "As with all TTM lessons, which are designed to emphasize the progressive and interrelated nature of math concepts, TTM Geometry builds on prior knowledge. By incorporating algebraic reasoning, theories and formulas throughout, students can master the big picture of conceptual math relationships, rather than simply practice a series of discrete lessons," said Director of content, Sara Byrne. Lessons and tutoring are available for students in both English and Spanish. The company has found pickup from schools in Oklahoma, where the state department of education has designated it as a supplemental math provider for the new school year and Comal Independent School District in Texas, among others.